We're back home from a wonderful and long vacation to Siesta Key, Florida, and Pittsburgh, Pennsylvania (my home). Bryce and I were away for 13 days and were eating and drinking all the while! There wasn't a bar, restaurant, coffee shop, ice cream store, etc., that we didn't visit. We're just as happy to be home in Seattle as we were to embark on an adventure, although now we need to get our consumption in check! We're hitting the brakes on eating out, slowing down on the drinking, and getting back into the habit of cooking in our own kitchen. 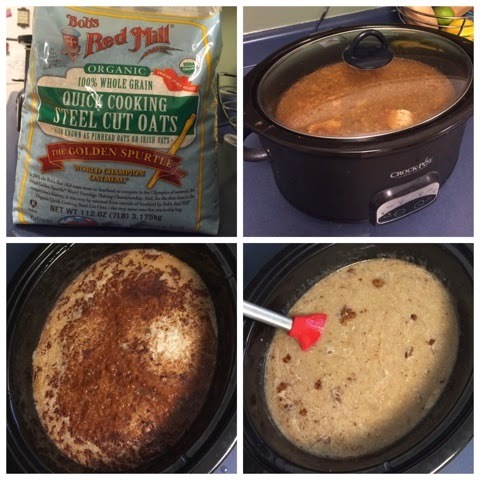 Earlier this week I made overnight crockpot oatmeal for the second time! I have a few more tweaks to make to the recipe and will hopefully post it in the next few weeks. 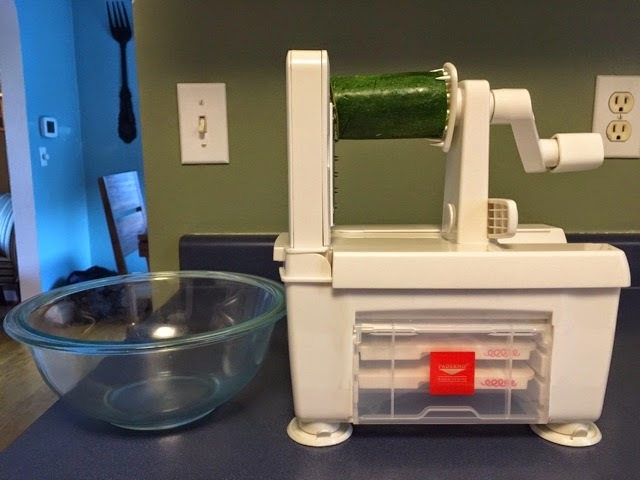 We've eaten it for breakfast each day to fuel the healthy train! 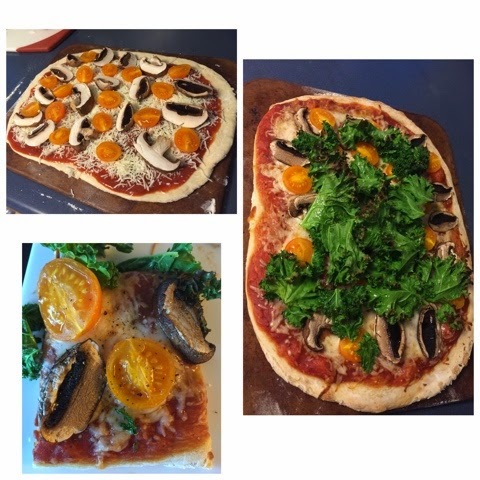 Last night I made pizza with portobello mushrooms, cherry tomatoes, and kale. 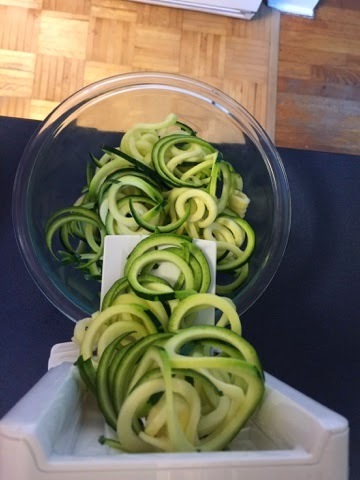 Tonight I broke out the Spiralizer (the Paedrno Spiralizer 4-blade from Williams-Sonoma, to be exact) for the very first time! I did nothing without consulting with Inspiralized - one of my favorite blogs to read - before getting started. Zucchini was perfect for my first experiment. Begin by trimming both ends and cutting the zucc in half to create a short and sturdy piece with two flat ends. Getting the machine setup was the only tricky part! 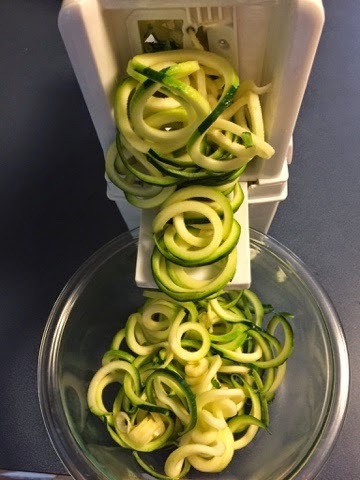 Spiralizing, or making zoodles, was as easy as could be, just turn the handle and be sure you've properly suctioned the machine to the counter. We used 2 zucchini but I wish we'd done 3. 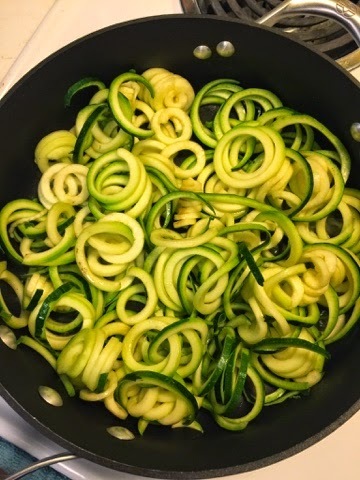 The zoodles are ADORABLE. Bryce kept talking about curly fries but they toally reminded me of curly hair! They're super long strands after being cut so be sure to cut them with kitchen shears unless you're planning to be stuck up in a tower waiting for a Prince. Raw zucchini is my JAM although Bryce wasn't into it. Taking pointers on how to prepare the zoodles from this recipe, I first sauteed mushrooms over medium-high heat with a small amount of butter and olive oil. After the mushrooms were cooked to my liking I removed them, added a bit more EVOO and butter, and threw in the zoodles. 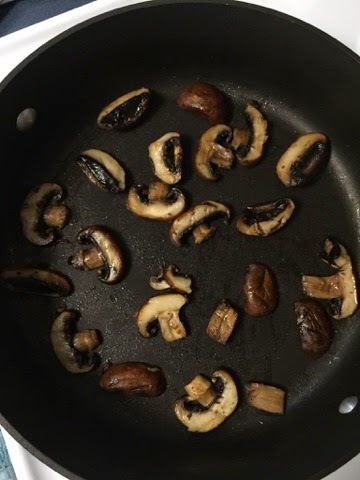 I seasoned with garlic salt and pepper and stirred often. They were golden brown after just about 4 - 5 minutes. You can see that their texture became a little more relaxed much like spaghetti does after it's cooked. Bryce had made salmon with pesto and we threw it, the mushrooms, and the zoodles together. It was delicious! 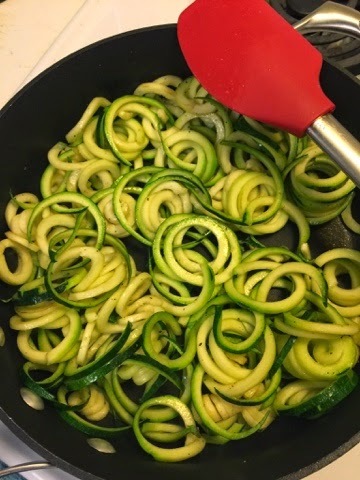 The zoodles were great and sauteeing them did eliminate the raw taste and crunchy bite rendering them soft and flavorful. 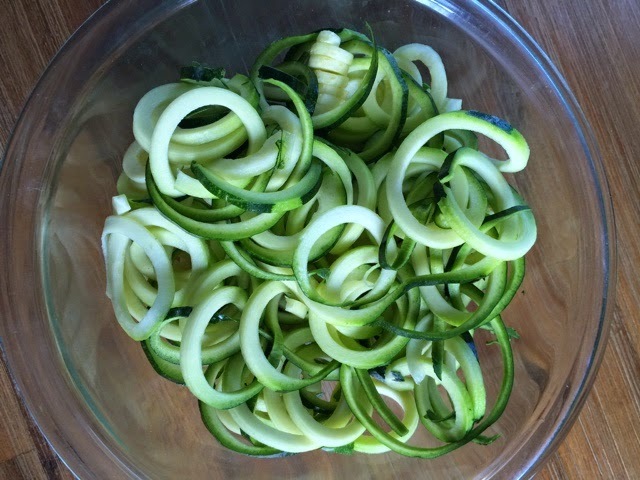 I wish I'd cooked another zucchini so that there would have been more! 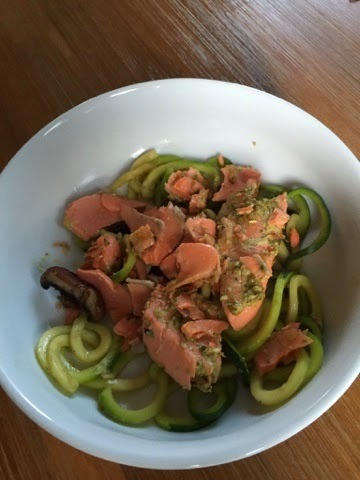 The combo of the zoodles, mushrooms, salmon, and pesto was killer! I'm happy to report that even the microwaved/reheated leftovers were still good. If you've been wanting to try these, don't keep waiting. 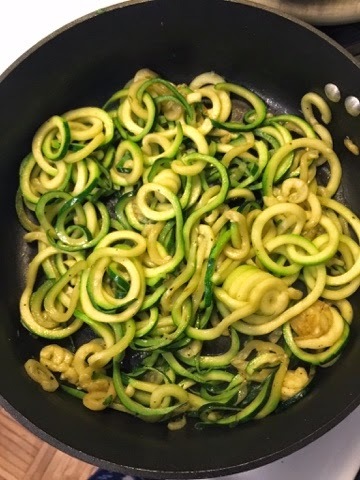 Stay tuned for more spiralized noodles and to feast your eyes on the delicious foods from our trip!